The loss of the sense of holding will lead to the loss of contact with Living Daylight, and this will result in a sense of deficiency particular to each ennea-type. The absence of holding is experienced in a certain way that is determined by the particular Holy Idea that is lost, and it is then experienced as a specific painful, deficient, and difficult state we call the specific difficulty for that ennea-type. With ennea-type One, the specific difficulty is the feeling or conviction that something is wrong with you, that you are imperfect in an intrinsic way, that you are fundamentally flawed. It is not that you did something wrong and you feel guilty about it, as in Point Eight, but rather that there is something inherently wrong with who and what you are.......... See also p151. The presence of the specific difficulty always puts you on the lookout for flaws. You observe yourself, scanning for any imperfection or wrongness so that you can correct it. If you are involved in spiritual work, the self-observation that is usually part of it is latched onto by the ego so that you can figure out what your problem is and change it. You check out your level of understanding and development, and compare it to others in the Work. You compare your current state to what it was when you thought you were more enlightened. You measure yourself against your standard of how a truly evolved person is supposed to be, and where in your spiritual development you should be now. There is incessant mental activity. You cannot leave yourself alone. You are always picking on yourself, believing that if you were different, then you could rest. But rest will never come this way, because there is really nothing at all fundamentally wrong with you. 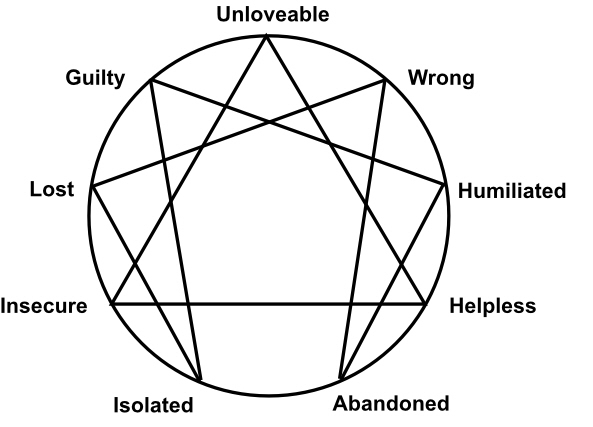 The specific difficulty and the specific reaction for each point of the Enneagram are determined by the delusion arising from the loss of its Holy Idea. The loss of holding is interpreted experientially through the filter of the delusion, so for ennea-type Two, not getting what you need from the environment (the loss of holding) is experienced as not getting your own way. The implicit belief that there is a separate you who can have your own way creates this sense, and the emotional state that accompanies it is one of humiliated castration. This state is the specific difficulty for ennea-type Two. Because of the belief that you can make things go the way you want them to, the loss of holding is experienced as an enormous blow to your pride, a deflating and humiliating slap in the face. This belief that it is possible to have a will separate from the rest of the universe is the pride of ego, and when it is deflated it feels like a castration, like your vitality and force are taken away, like what you are isn’t effective, powerful, or good enough.......... See also p135. This whole constellation of the sense of deficiency (the specific difficulty of humiliated castration) and the reaction to it (the specific reaction of willful action) forms the core of this ennea-type. Out of this core, all of the characteristic manifestations of manipulation, seductiveness, and physical, emotional, and mental influence arise. The loss or inadequacy of holding in childhood, reflected through this delusion of vanity, leads to the specific difficulty of ennea-type Three. The specific difficulty, as we have seen with each ennea-type, is how the environmental inadequacy in holding in early childhood is reflected in one’s personal experience. Here, there is the belief that one is a separate and independent doer, and at the same time, the experience that the environment is inadequate and unsupportive. You feel abandoned, rather than held and supported, and you have the sense that no one is taking care of you adequately. While feeling the deficiency, difficulty, and suffering of your experience, there is the growing conviction that you are a doer, that you can act. In other words, the inadequacy of the environment cuts you off from the experience that everything is occurring harmoniously without having to do anything yourself, while at the same time, you begin to believe in yourself as a separate doer. You take the inadequacy in the environment on yourself, believing that you should be able to take care of yourself, since through the delusion, you take yourself to be a center of action. So instead of seeing that the inadequacy is in the environment, you come to believe that it is within yourself. Since you aren’t able to provide for and take care of yourself, you not only take it to mean that you can’t do these things on your own, but you also take it as a failure, and feel unable, inadequate, and incompetent. If you did not believe that you are an independent doer, it wouldn’t make sense to believe that you are inadequate or a failure. So from the perspective of Point Four, the loss of holding will be experienced from the point of view of the delusion that there is a separate identity and center. The specific difficulty, then, is the experiential state of feeling disconnected, estranged, alienated, cast out, and abandoned. This feeling state is different from the sense of isolation, which is the specific difficulty of Point Five. The feeling here is a disconnection from oneself, from reality, from the Source. This is what gives people of this ennea-type the sense of melancholy, despair, and sadness, since the disconnection is ultimately from the Beloved, from the ultimate Source. So the state of disconnection is a painful condition in which you feel not held, but also estranged from the source of holding. It is the narcissistic difficulty, but experienced specifically as being cut off, being unreachable, or feeling that the source of holding is unreachable. So we are seeing here the particular way that the loss of holding is experienced when reflected through the facet of this particular delusion, in contrast to the sense of connection in which one feels at home, at peace with oneself, and intimate with the Beloved.......... See also p202. So the loss and the sense of feeling disconnected that is the specific difficulty for this point is a very wrenching kind of estrangement. To really get a sense of it, imagine a two- or three-year-old child who has been more or less continuously with its mother, and then is taken away from her suddenly and completely. How would this child feel? What condition would the child be in? Even if the child survives, life loses its flavor and becomes dull. There is not only emptiness but also grief and depression. So the sense of disconnection that we are discussing here is a profoundly unhappy state, in which it feels like the one you love the most is unreachable and inaccessible. As we have seen, when this sense of omniscience and transparency is absent, there is a distorted perception, the delusion of being a separate entity. This delusion of separateness is the seed of the ennea-type, giving rise to its experiential core. For those of this ennea-type, the specific difficulty resulting from the loss of the sense of holding is experiencing oneself as small, isolated, cut-off, empty, and impoverished—it is a state of deficient isolation. This sense of feeling isolated, alone, and abandoned as a result of the loss of holding results from the belief in separateness, the specific delusion of ennea-type Five. The specific difficulty of ennea-type Six is the experience of the inadequacy of the holding environment as reflected through the filter of cynicism. In other words, it is how you experience the lack of holding from the perspective of cynicism. The lack of a sense of holding, or the holding being negative or inadequate in some way, plus the lack of belief that there is real goodness within oneself and in the environment, leads to a lack of trust that reality is supportive. So the sense of not being held adequately, seen from the cynical perspective, makes you feel that it is not possible to be held adequately. No one is going to be there for you out of selfless and caring goodness, and real loving and true support and nurturing are not possible. So not only do you feel that holding is not present, you also come to believe that it is not possible to obtain.......... See also p241. The loss of the Holy Idea, the loss of the holding, and the development of distrust are all components of the same process, and they happen simultaneously over the course of the first five years or so of life. The sense may be that my mother is there for me only because she’s my mother and it is her duty and responsibility—not because she loves me. Or the cynicism might be more extreme—that she’s not there at all. In either case, the feeling-state that results, the specific difficulty, is a fearful kind of insecurity. You feel insecure and scared at the same time. There is an underlying and intrinsic sort of insecurity that is constantly present because you don’t feel held, and since you don’t feel that you’re going to be, you feel constantly edgy and scared. This fearful insecurity reflects the belief and the feeling or sense that the world is a dangerous place inhabited by self-seeking people, and that there is no inner essence to support and guide you in this frightening world. Your soul feels insecure because the world appears as a scary jungle and you don’t have inner strength to deal with it. For this ennea-type, the specific difficulty, the experience of the absence of holding seen through the filter of the specific delusion, is the loss of the capacity to know what to do. The feeling state is one of disorientation and a sense of being lost, the sense that, “I don’t know what to do,” or “I don’t know which way to go.” Knowing what to do implies that you know which way to go, which in turn implies that you know what is optimally supposed to happen next. In the absence of the sense of holding, a state of deficiency arises in which you feel that you should be able to know what to do, based on the delusion that you can direct your own process, but that you don’t know because something is lacking in you. As we saw in Part One, the loss of an Idea is the same process as the loss of a sense of holding in the environment and the loss of basic trust. So the loss of Holy Truth leads to the specific delusion of duality. Loss or inadequacy of the holding environment results in the painful egoic state that we call the specific difficulty. Here, the loss of holding, filtered through the delusion of duality, results in the specific difficulty of a sense of badness, guilt, and fundamental sinfulness.......... See also p93. You sense that what is most true and precious has been lost and destroyed, and that someone or something is to blame. Through the filter of the delusion of duality, one thing becomes perceived as being in opposition to another, and one side is guilty. The loving and perfect truth has been lost, and so someone has committed a crime or a sin here, and must be found and punished. This is the position of the ennea-type Eight, which has been called Ego Venge. Ultimately, you blame yourself for no longer being divine, and later this blame is projected onto others in order to protect yourself from the self-hatred that would otherwise result. So the belief in the conditionality of love and the sense of it being localized are two sides of the same deluded perception of reality. This delusion forms the seed out of which the ennea-type Nine grows and develops. The core of each ennea-type is a complex, as we have seen, made up of the specific delusion, the specific difficulty, the specific reaction, and the dynamic interaction among all of these. This notion of the core being a complex is particularly relevant to Point Nine because its core is what is called, in psychological terminology, the “inferiority complex.” The loss of the Idea of Holy Love and the difficulties in holding are colored here by the delusion of the localizability of love, resulting in the subjective state of feeling inferior. In other words, when the loving holding in the environment is lost or inadequate, a belief arises that love and lovableness are conditional. When you don’t feel held, you feel that you are not loved because you don’t have what is lovable. Obviously, to feel that you are not lovable involves the delusion that lovableness can be a local phenomenon, that it’s not within you, and that it must be located somewhere else.......... See also p219. Ego intrinsically feels inferior. No matter what it owns, what it has, what it does, or what it can do, it will continue feeling itself to be inferior. As long as you allow the possibility that intrinsic goodness can be located in one place and not another, you allow the possibility that it can be located somewhere else. If you are identified with the ego and anything goes wrong, you immediately assume that it happened because what is good is not inside you. The slightest criticism, the slightest negativity, and right away you believe what is good is located somewhere other than inside you. This is why all children begin to believe that there is something wrong with them as they come to identify with the ego. If this difficulty is not understood and worked through, it will remain even if you are experiencing Essence. You cannot fully see or feel the beauty, importance, value, and loveliness of your own nature, which is Essence or Being, of your functioning or creativity, and of your existence or life. The issue here is not disconnection from Being—that is the particular difficulty of Point Four—it is, rather, that you are not in touch with its blissfulness even as you experience it. You can be in touch with Being, but cannot feel or see its loveliness, as though the essential presence were covered by a membrane or a veil shading its ecstatic luster. A good holding environment is not just a matter of the mother loving and providing physically for her child; the emotional climate in the family is a part of the holding of the environment as well. If there is tension between the parents, for example, the child will feel it and the sense of holding will be somewhat disrupted. The presence or absence of other siblings and their interrelationships also affects the holding of the environment, as do the environment’s actual physical qualities. Whether it is chaotic or dreary, too noisy or lacking in stimulation for the child, all affect the amount of holding he or she experiences. What the family as a whole is going through will affect it. If the family is going through a difficult financial period and there is a sense of fear and insecurity in the parents, this will not only affect the parents’ relationship to the child directly, but will also create an anxious environment full of expectations of difficulty or danger. If the child grows up during war-time, the holding will also be compromised. Physical traumas, such as the child getting sick, or one or both parents becoming ill, will be experienced as disruptions in the sense of being held and therefore in the sense of basic trust. The effect of whatever disruptions occur will be cushioned and mitigated to the degree that the environment is generally holding. The inadequacy of the early holding environment leads not only to the loss of contact with Being, as reflected in the loss of a particular Holy Idea, but also to the loss of basic trust, which is an innate, unquestioned, and preverbal confidence in reality. This loss leads to specific distrustful reactions determined not only by the inadequacy of the holding environment, but by the particular delusion that results from the loss of the particular Holy Idea. The specific delusion, the specific reaction of distrust, and the particular way in which the self experiences the inadequacy of the holding environment (the specific difficulty, which is again qualitatively determined by the particular delusion), form the elements of each fixation’s particular core. These three elements develop simultaneously as a consequence of the loss of Being, which results, at least partially, from the inadequacy of the early holding environment.